Create Note. 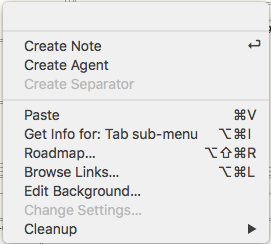 Create a new note, placement varies by view type. Create Agent. Create a new agent placement varies by view type. Create Separator. Greyed out in views other than Map view. Create a new adornment. For maps the item is created in the click position. Paste. Paste clipboard contents to the view. Get Info… Always greyed out, as there is no selection. Edit Background… Opens the Edit Background pop-over. Change Settings… Greyed out (opens the Timeline Settings pop-over). Cleanup. Opens Clean-up sub-menu - greyed out in views other than Map view.